4/22/2019 6:50:13 AM - So I couldn't make a newsletter for the January 1 new year, but at least I made it for the Chinese new year! I trust everyone is starting 2007 well and staying healthy. NEW PROJECT WITH ARTISTSHARE!! -- It has been incredibly busy for me this last month and half, unfortunately doing a lot of mundane computer work, writing, and tedious administrative stuff, but all for the love and purpose of finally launching my new project with ArtistShare. The project name is "Flow" and I am very excited about the concept, creative potential and just really getting in there and sinking my teeth into it. It will be launching before the end of the month alongside a facelift for my website -- please check out www.mondaymichiru.com for more on the "Flow" project and what I am planning for it. 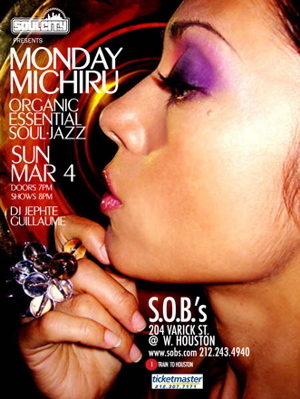 LIVE AT SOBs, March 4 (Sunday) -- After a series of tours in Japan much of 2006, I am happy to finally be able to do a live here in my home state, New York, and SOBs is the place! Our 4th time there, we have a great band lined up for our Release and Launch Live: My husband of course on trumpet and flugelhorn, Hans Glawischnig on bass, George Colligan (who we went to Indonesia and Japan with recently) on keyboards, and Masanori Amakura on drums. Masa is actually living in Japan and I began working with him last July and he is BAD! (...you know that means GOOD "bad.") He planned his vacation to New York and I couldn't resist putting together the SOBs live to coincide with his trip here. "ALTERNATE ROUTES" Remix EP-CD Release! -- Gosh, can you handle all this new stuff?! This is what I've been destroying my eye sight and giving up my social life for! Yes, it's finally out, a compact EP of 6 tracks: 5 remixes and 1 original track. Already some of the tracks are creating a buzz in the underground, namely the one of "The Right Time" remixed by Jephte Guillaume (who will also be spinning at SOBs on March 4). This CD is available exclusively through my website as part of the new "Flow" project under various packages. ETC -- In an effort to keep this one short, I won't go through the zillion other pots I've had my hands in nor talk about some upcoming stuff because I am sworn to secrecy, but more to come. There's talks of a tour in Japan during the summer, and a couple other dates in Manhattan to boot, so as the dates firm up I'll definitely keep you in the loop. On a different subject, I want to congratulate trumpeter/composer/arranger Brian Lynch for his Grammy win on his ArtistShare release "Simpatico"! Brian played for years in my mother's big band, and also did collaborations, arrangements and playing on my albums in the past, so I feel like a family member has won! Keep yourselves warm, healthy and happy!